Think Tank Initiative (TTI) had four primary objectives: (i) to evaluate the programme concept and design, (ii) to assess the implementation of the programme, (iii) to determine the intermediate outcomes and impact, and (iv) to provide suggestions for improving the design of Phase 2. Desk-based research included a review of key project documentation, interviews with stakeholders, a literature review of comparable programmes, an analysis of the TTI monitoring and evaluation (M&E) database, and collection of 65 Stories of Change from project stakeholders. The Stories of Change, and results of the other desk-based research were triangulated through meetings, interviews, and workshops with 17 TTI grantees and a range of other stakeholders during visits to eight countries in Latin America, East and West Africa, and South Asia. The emerging findings were then validated via an online follow-up survey of informants and at meetings with the TTI Executive Committee (EC) and International Advisory Group (IAG). 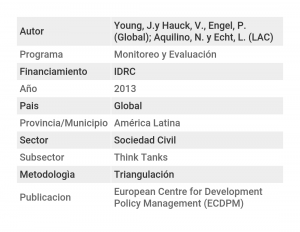 The evaluation team found the TTI theory of change to be robust and well rooted in scientific and practical knowledge about the role of think tanks and initiatives designed to strengthen their capacity. TTI’s overall aim and programme design are clear and well understood by stakeholders. Furthermore, the combination of core funding and technical assistance to funded think tanks, alongside the programme’s Matching Funds mechanism to support collaborative initiatives, is widely regarded as an effective formula. (…) It is difficult to attribute changes in think tank performance during the course of the programme solely to TTI’s contributions. Nonetheless, there is satisfactory evidence that improvements such as those documented above have started to influence wider changes in policy and practice.